Click the button below to add the DARA'S BRACELET INSTRUCTIONS DOWNLOAD (1 unit) to your wish list. Dara’s bracelet for her special day! Share her excitement with bead woven separator bars separating beautiful islands of bead strung beads. we will need to substitute something of similar color and quality. This bracelet is made up of either Czech fire polish beads or Austrian Crystal beads, strung on a cable thread, in this case Fireline brand, and secured with knots. The bracelet has a strong pattern to it, namely a series of triangular spaces. 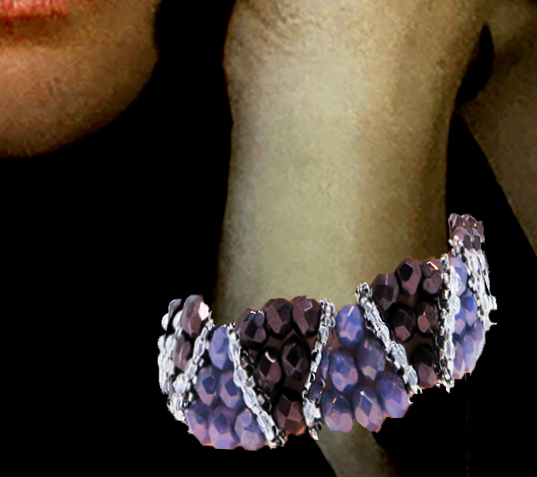 Even though coupled with an adjustable clasp assembly, the pattern limits the useful size of the bracelet. For a much smaller wrist or a much larger wrist, you would need to either remove or add a triangular space to the design. This bracelet was originally designed for the bridesmaids in my niece Dara’s wedding. I wanted to design a bracelet that would coordinate with their dresses, but which could also be worn outside a wedding setting. My niece had sent me photos of bracelets she had seen on Etsy and which she liked, and I adapted the design, based on her preferences. I wanted to create a strong bead woven element in the pieces, as my special signature and personalization. 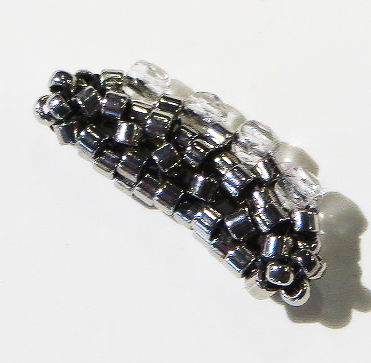 Dara’s preferences focused on bead strung pieces using larger 6mm and 8mm beads. She liked things which had a very contemporary and bright feel to them. She preferred silver over gold. I played around with ideas until I settled on this particular design. While the original pieces were a combination of sterling, palladium and Austrian crystal, I adapted less costly materials for this particular project. One critical key to the success of this piece has to do with the integrity of the separator bars. I had to come up with a design that allowed the components to function as “separators”, but to maintain their shape as the pieces were worn. I decided that combining two stitches – Right Angle Weave and Peyote – would allow me to meet these criteria.